A TOOWOOMBA chocolate lover is on a one-woman mission to get a Max Brenner store to open in town. Max Brenner is a worldwide chocolate restaurant with more than 50 stores world-wide. Karissa Gesler is so obsessed with the chocolate haven that she has taken to social media to get the Max Brenner team to listen. She has written to the team on the site's official Facebook page twice now, receiving an hilarious response. She decided to send the first message after finding out that Rockhampton was now home to a Max Brenner, while Toowoomba is not. "I'm writing to you to inform you of the terror in which myself and my friend suffered because of one of your store (or lack there of to be exact). "Now to begin I am a massive fan of your store. Karissa Gesler has messaged Max Brenner asking them to please bring a store to Toowoomba. 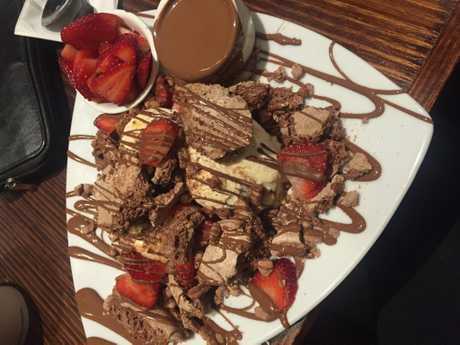 "A very regular customer and due to the fact you are yet to have a store in Toowoomba I find myself travelling to the nearest Max Brenner every weekend in Brisbane just so I can get my hands on the chocolatey goodness that you have bestowed upon us. "Two hours for chocolate. Dedication at its best. Just for the sweet fix. Bring a store to Toowoomba." "We can only imagine the roller-coaster of emotion this experience may have caused. "There should be nothing that stand in between you and some Max Brenner chocolate. "We will keep Toowoomba in mind." Ms Gesler said she was thrilled when they replied. "It is great that they have a sense of humour and took the time to reply," she said. "I love everything about the restaurant. Everything tastes amazing and I know that it would be really popular if it opened in Toowoomba. "If I started a petition, I know it would get thousands of signatures. "I don't think Max Brenner realises how big Toowoomba is these days. If they realised what a boom our city is going through I think they would open." Ms Gesler sent her latest message to Max Brenner just this week. This time threatening to eat salad if they didn't open a store, quoting the Liam Neeson movie, Taken, in the process. "I have an offer you can't refuse. Either bring one of your stores to Toowoomba or I will have no choice but to eat salad. "The fate of my stomach is relying on you to save it. "Now. I don't know who you are, I don't know what you want, If you are looking for a ransom I don't have any money but what I do have is a very particular set of skills. "Skills of eating chocolate that I have acquired from over the years. "Skills that make me a godsend to you. "I will look for you, I will find you and I will eat your chocolate." Max Brenner is yet to reply but Ms Gesler said she won't stop until a store opens in Toowoomba.